Halloween is upon us! Even though the actual holiday isn't until next week, with the weekend pretty much here, most of us will be throwing on our costumes and heading out for various Halloween parties and whatnot. And odds are, if you're putting on a costume for Halloween this year, it's influenced by a popular movie from the past 10 months. 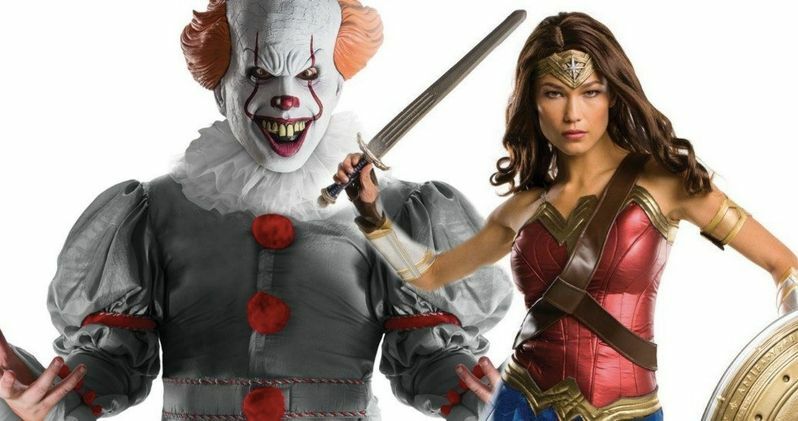 Specifically, there's a pretty good chance you're dressing up as Pennywise the clown from IT or Wonder Woman, according to a new survey. Fandango conducted a survey of more than 1,000 moviegoers, asking them what movie-inspired costumes they're going to be wearing this year. The answers were limited to costumes inspired by 2017 movies. The top choice for male costume was Pennywise from IT and the top choice for female Halloween costume was Wonder Woman. Here's what Fandango Managing Editor Erik Davis had to say about it. "Wonder Woman has had an immense cultural impact on the world since Patty Jenkins' film debuted over the summer, and it's a real affirmation to see that character prevail as the top choice for female Halloween costumes inspired by 2017 movies. For the majority of fans, she is the most anticipated part of Justice League and is no doubt helping fuel our advance ticket sales. It's also exciting to see Pennywise topping the male costumes list, and somewhat surprisingly, Ansel Elgort's Baby Driver rounding out the top five." The top choices aren't all that surprising. Wonder Woman became a groundbreaking blockbuster as the first female-led comic book movie of the modern era. The movie did massive business at the box office and inspired quite a few women around the world. As for IT? The movie is still going strong at the box office and it's become a true cultural phenomenon. Bill Skarsgard's Pennywise is no small part of that success. And what's more fun than dressing up like a creepy clown on Halloween? Fandango's survey also looked at popular group costumes, which also included IT. Plenty of friends are going to be dressing up as The Losers Club this Halloween. Popular group costumes also included movies like Guardians of the Galaxy Vol. 2, Star Wars: The Last Jedi and Justice League. Interestingly enough, two of those movies haven't even been released yet, which speaks volumes about how excited audiences are for the movies to hit theaters. For male costumes, Stormtrooper (Star Wars: The Last Jedi), Star-Lord (Guardians of the Galaxy Vol. 2), Batman (Justice League) and Baby (Baby Driver) round out the top five. For female costumes, Belle (Beauty and the Beast), Leia (Star Wars: The Last Jedi), Annabelle (Annabelle: Creation) and Rey (Star Wars: The Last Jedi) filled the top five spots. You can check out the full lists of 2017's most popular Halloween costumes, courtesy of Fandango, for yourself below.